The Exploratory has an entire hangar dedicated to the marvels and milestones of space exploration. 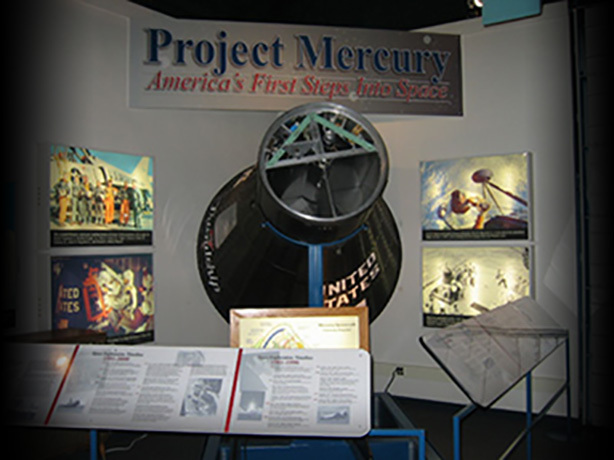 A replica of a Mercury Space Capsule gives visitors an up-close look at the small pod that represents the United State’s first manned spaceship. The Mercury Space Capsule is compact, only 6-feet 10-inches long and 6-feet 2½-inches in diameter. And while small, the capsule’s significance is grand, representing America’s first steps toward human space flight. The five-year run of the historic Project Mercury missions were the precursor to the first moon landing in 1969. The original group of astronauts chosen for the program were called the Mercury Seven and included: Scott Carpenter; L. Gordon Cooper, Jr., John H. Glenn, Jr., Virgil I. “Gus” Grissom, Walter M. Schirra, Jr., Alan B. Shepard, Jr., and Donald K. “Deke” Slayton. The Mercury Space Capsule protected the space pioneers as they blasted off into space, and then brought them back down to Earth.